It can often be confusing trying to decide which spring bulbs to buy. We hear so much this time of year about forcing bulbs for Christmas that it can seem like our spring flowering bulbs are almost forgotten. We have compiled a Top 5 list of our favourite spring bulbs along with a handy guide on when each should be planted. As there are so many to choose from, it was a hard task narrowing it down to just a few, however after much deliberation we have finally agreed on our Top 5 Flowering Spring Bulbs! We recommend you plan your planting, have a clear idea of where you want to plant the bulbs and which colours and textures will look best in your garden. Regardless if you are planting using containers or in your beds and borders, it is important to give your bulbs a great head start by getting the soil right before you begin. 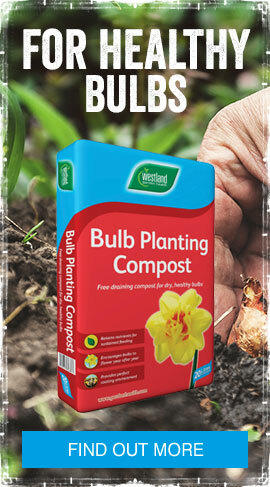 For containers, we recommend Westland Bulb Planting Compost, this specialist compost is the perfect environment for root growth. If you have decided to concentrate on your beds and borders and have heavier soil, then mix in some Horticultural Sand. This will break up the hard soil aiding the establishment of the bulbs. This horticultural sand could also be mixed together with compost to produce a looser structure, and this will help prevent root damage to delicate shoots and bulbs. 1. 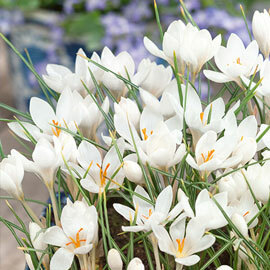 Crocus Biflorus “Miss Vain” (Scotch Crocus) – We chose this beautiful flower as it will bring early life to your garden. The Miss Vain will bring hope in the still dreary mornings. She is a welcoming cheery start to the flowering season. Sometimes the simplest of flowers are often the most beautiful, and this wonderful plant falls into this category with its light fragrance and soft, snow-like petals. It requires such low maintenance that it is almost always guaranteed to bloom without too much help from us. The flower looks spectacular in large sweeping drifts. The Miss Vain bulb can be planted from October through to November and should start to bloom in early spring – often as early as February, reassuring us our gardens are still alive. 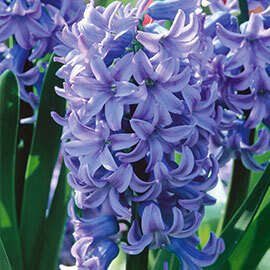 Hyacinth Blue Star – Hyacinth Bulb – This adaptable flower can make a home in either full sun or part shade, making them an option for anywhere in your garden. Regardless if your garden is little or large they will make an eye-catching impact wherever they are planted. They are extremely fragrant, and feature tightly flowered spears of soft flowers which pale in colour at the edges. The beautiful Blue Star should bloom for nearly 3 weeks starting in either March or April, and they can be planted from September right through until November. 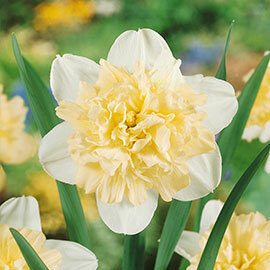 Narcissus Ice King (Double Daffodil) – Well it wouldn’t be spring without a member of the Narcissus family. The flower produces peony-like centres, and the outer petals are white which contrasts perfectly with the yellow petal-rich centres. These then turn an attractive ivory colour over the season. They are certainly one of the more impressive members of the narcissus family which can be planted from September right through until November. You should start to see the royal heads spearing through to bloom from March time. 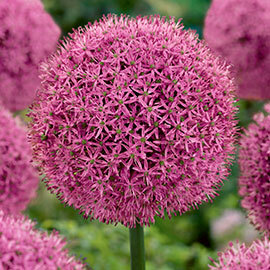 Allium Gladiator – Allium Bulb – With a multitude of perfect Alliums to choose from we have decided upon the Gladiator variety to make our Top 5 list. This beautiful plant with its large rounded head will add drama and intensity to any flowerbed. The flower itself still remains attractive all year even when they have spent their seed heads. They are also an excellent choice for cutting. The Gladiator bulb can be planted from September through to November and should start to bloom in mid spring. Tulips – Sunset Tulip Collection – Among the most popular of bulbs, the Tulip is stunning when solely in their own group or alternatively mixed in with an array of varieties. We are slightly cheating here as rather than one variety, the Sunset Tulip Collection has a combination of Tulip Brown Sugar, Tulip National Velvet, and Tulip Queen of the night. Together they make a beautiful array of tulips which will be an eye-catching feature in any gardener’s flowerbeds or containers. 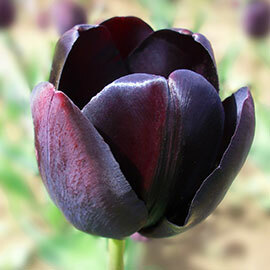 The Sunset Tulip Collection can be planted from September right through until November. You should start to see blooms from April time. Pictured below is the Queen of the Night variety found in this collection. We could go on adding to the list but deciding (agreeing) on a Top 5 took us quite a while and as there is gardening to be done we will leave it at 5. However for more inspiration, check out Unwins website for an array of spring flowering bulbs, or for further reading, check our Bulb Advice articles here.